How do you improve on a good thing? If you’re part of the team that writes and produces the The College Juice, the only answer to that question is to make it even better. The Barnes & Noble College student blog had already established a firm and growing audience at campuses around the country, but the team wanted to begin the new year with a new look for the popular site, and unveiled a complete makeover of the The College Juice last month. “We had actually wanted to change the design for some time,” explains Barnes & Noble College Social Media Specialist, Sandra Webb, who also edits The College Juice. “We wanted to create a more aesthetically pleasing blog, and help our readers more easily navigate the site,” she adds. Ryan Huhn, Assistant Graphic Designer for Barnes & Noble College, was responsible for the new look of The College Juice, and detailed another key design issue. 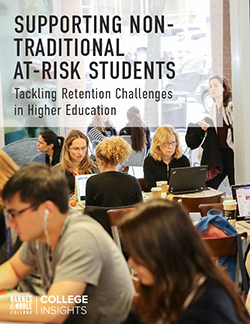 “Increasingly, students are viewing the site on tablets and cell phones, so the site needed a more responsive design — optimized for those multi-device experiences,” he explains. It’s an important point for a core audience of Millennials who are increasingly accessing their information on a variety of mobile devices. “We also wanted to make the design more evergreen, and easily readable on whatever device our students want to use,” he adds. 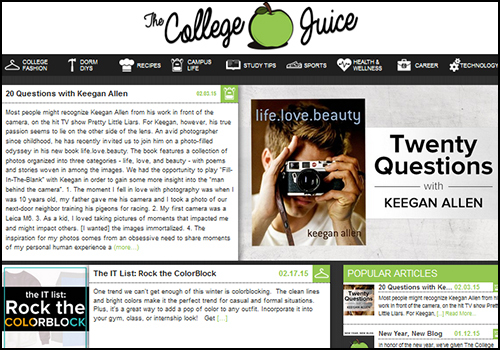 The launch was marked with a promotional emailing on the “New Year, New Blog” theme, calling attention to the updated design and also asking students to tweet with the hashtag #TheCollegeJuice, suggesting what types of articles they’d like to see featured on the site. 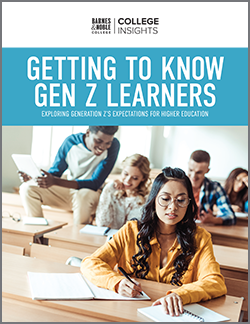 “We could tell from the tweets we received that the students had put a lot of thought into the kinds of content they thought would best support their college life and interests,” explains Webb. That feedback also helped with the overall design of the site, where users can now more easily navigate through the subjects that interest them, from fashion advice to food recipes to popular music. 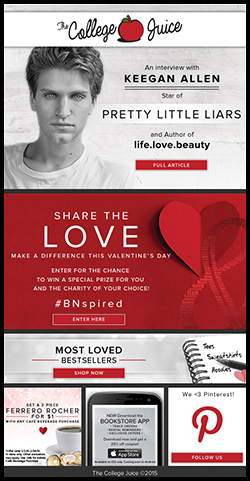 The new website also provides a better platform to showcase products and special offers available from Barnes & Noble College marketing partners such as Adobe and Zip Car, who helped with the launch promotion. It will also support a regular feature on books of interest with author interviews and showcases of popular titles at campus bookstores. Not all of the new enhancements to The College Juice are contained within the site’s sleek new makeover. There are also other initiatives, such as a monthly digest newsletter focusing on a topical theme, and Webb is always interested in getting more student participation on the blog, whether from student campus booksellers or interns who work on the project during summer break.